If you are a homeowner looking to borrow money, you’ll know there are many options available to you. Whether through your bank or building society, an online loan company or through a recommendation from a finance professional. If you're wondering how to ensure you get the right secured loan for you, then call us today and let one of our experienced team help to guide you through the process and see what the best secured loan options are available to you. A full understanding of your personal financial circumstances will need to be gained in order to make the right decision about a secured loan for you - to ensure it's affordable. Qualifying for finance has become much harder and there are many factors that can influence the final decision. So although dealing directly with a bank or lender is arguably the first choice for many people, the fact is thousands of people are refused, for all sorts of reasons. However, some loan providers have much greater flexibility when a borrower is able to offer security to cover the loan and it makes it easier for them to say ‘yes’, when others may have refused all options. It also means lower rates can be offered, and there are also options for people whose credit history isn’t perfect. Knowing who those lenders are is therefore the key to finding the most suitable option, and that is one of the many strengths that a loan broker, like Loans Warehouse, possesses. So if you're wondering how to get a secured loan, make Loans Warehouse your first call! What is the value of your property and how much is left to repay? Is the property jointly owned? Do you have problems keeping up with monthly living expenses? What other kinds of loans or credit cards do you have currently? How much do you want to borrow, and what is it for? As an independent broker, Loans Warehouse acts for its customers by working closely and negotiating with leading UK lenders. With up-to-the-minute information and in-depth knowledge about the vast range of options available from our close working relationship with leading lenders, we search the market for the right loan to suit a customer’s criteria. Completing an application form is the best way to find out exactly which loans are right for you – but remember you’re under no obligation to take the loan. You’ll be given examples showing how much you can borrow and how much it will cost overall and you will also have options such as different repayment amounts and repayment terms. We make sure that the loan is tailored to meet your personal requirements and everything about the loan will be explained clearly just so you are happy you are making the right choice. 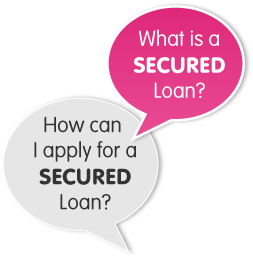 Loans Warehouse will be delighted to show you how to get a secured loan and explain how it could benefit you. Call us or apply now and we guarantee you will be delighted with every aspect of our service. We can discuss your requirements with complete confidentiality and without obligation.